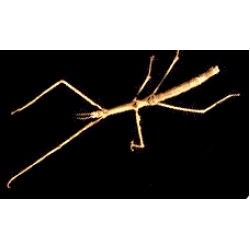 A calm, child-safe species of stick insect that responds to handling easily and will not try to run. It cannot fly and does not spray pungent chemicals. They are night-active, during the day they sit still or are seen in rocking type motion when the air moves around them. Bramble leaves, Oak and Hawthorn leaves are good food for Zompro’s Stick Insect. It will also accept rose and raspberry leaves. This stick insect species is very easy to keep at warm room temperature around 20 °C to 30 °C with night time temperatures allowed to drop a little. To keep the air humidity up for moulting you must spray their enclosure every day which also allows them to drink from foliage etc. Zompro’s Stick Insect needs both males and females to reproduce. The males are more slender with a smoother skin growing to 5-6cm living 3-4 Months. Females are larger with broader bodies and can grow to 9-10cm and have wonderful coffee brown and black markings. They will live up to 6 months, producing large numbers of irregular shaped brown eggs dropped to the ground. The eggs take up to 5 Months to hatch, depending on conditions and time of year.